Seek out Hassour Zainsubani in Ald'ruhn and ask him about the Ashlanders and the Nerevarine Cult. Return to Caius in Balmora for your orders. Meet with Hassour Zainsubani in the Ald Skar Inn in Ald'ruhn. Visit the nearby bookseller, Codus Callonus, and buy a book as a gift for Hassour. Give the gift to Hassour and receive the note for Caius in return. Return to Caius in Balmora. Caius Cosades' next task is to try to establish an Ashlander informant. He has heard rumors that Hassour Zainsubani, an Ashlander who is now a wealthy trader, is staying in Ald'ruhn. Caius gives you 100 gold and asks you to try and find out what he likes and buy him a present in the hopes of persuading him to talk about the Ashlanders tribes and their relationship to the Nerevarine Cult. Although Caius says he's not sure where to find this gentleman, he suggests the Ald Skar Inn. If you haven't been to Ald'ruhn before, it's basically far north of Balmora, past Caldera. The quickest way is to grab a Silt Strider from Balmora, although Mages Guild members might prefer to use the Guild Guide instead. The Ald Skar Inn is just southwest of the big Manor District building in Ald'ruhn and Hassour is on the middle level (there are stairs right of the bar leading to the area). First thing to do when you talk with Hassour Zainsubani is ask about business and that will bring up the topic about gifts. Chatting with him you indeed find out that it is an Ashlander custom to give gifts and that Hassour's passion happens to include poetry. So, just give him that book of poetry you've been reading and... what, you don't have one? Well, time to visit the local bookshops to see what books they have in stock. Note that you can also talk to other people to get this info, or explore his room to see what sort of books he has. Just as luck would have it, Codus Callonus' bookstore is located nearby, and Codus actually suggests a few selections when you mention Hassour (Words of the Wind 45 gold, Ashland Hymns 35 gold, or The Five Far Stars 25 gold). Now, if you have explored Hassour's room, you'll know he already has all three of them but he'll accept any as a gift. If you're really tricky (and cheap) you can steal one of his own books from his room and give it back to him (he shouldn't notice). Alternatively, if you raise his disposition to 80 or higher, you can discuss the Ashlander gift-giving customs, and he will take your "thought and effort" as a gift. Once you get Hassour to talk with you about the Ashlanders and Nerevarine Cult, you'll receive his notes for Caius. Return to Caius, and he again promotes you and suggests you keep the notes, as he is sending you to the Urshilaku Ashlander Camp that Hassour mentioned. He also goes on to explain things a bit. It appears that you were released and recruited on the Emperor's orders. The Emperor believes that you may fit the Nerevarine prophecies. Caius gives you a decoded copy of the original package you delivered to him along with 200 gold and instructions to see Somutis Vunnis and Crulius Pontanian at the Moonmoth Legion Fort before heading up to see the heads of the Nerevarine Cult at the Urshilaku Camp. 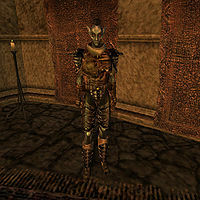 It is somewhat interesting to note that Hassour is in the Thieves Guild, meaning it will be easier to persuade him if you are also in the guild, but more difficult if you are a member of any of the Great Houses or the Temple. Hassour's disposition is set to 70 when you hand him a book, not raised by 70. If you press him for information without having given him a book, his disposition drops by ten. With Hassour's disposition at 80 or higher, simply asking after the gift-giving customs of the Ashlanders will satisfy Hassour, and he will respond that your thoughtfulness of attempting to locate a gift for him is enough to make him happy. He will then freely provide the information necessary for the quest, and the act of buying a gift is skipped. Hassour might not be where he is supposed to be. 1 The Spymaster has sent me to see a fellow named Hassour Zainsubani, an Ashlander who left the Wastes to become a wealthy trader in Ald'ruhn. He gave me 100 gold and told me to find out what Zainsubani likes, and get him a gift. Then I'm to give him the gift, and ask him to tell me about the Ashlanders and the Nerevarine cult. When I have the information, I'm to report back to the Spymaster. 10 Boderi Farano, the publican of the Ald Skar Inn, says that Hassour Zainsubani has many books in his room, and perhaps that would be a suitable gift. 30 Hassour Zainsubani says that among the Ashlanders a thoughtful gift shows respect and knowledge of the one who is to receive the gift. Fortunately... or perhaps by courtesy or design... Hassour Zainsubani has mentioned that he loves poetry. Then a book of poetry would be a perfect gift for him. Perhaps a bookseller, merchant, or pawnshop nearby may have such a thing. 31 As a gift, I gave Hassour Zainsubani a copy of "Ashland Hymns." He seemed surprised and pleased. He thanked me and offered in return to answer my questions about the Ashlanders and the Nerevarine cult. 32 As a gift, I gave Hassour Zainsubani a copy of "Words of the Wind." He seemed surprised and pleased. He thanked me and offered in return to answer my questions about the Ashlanders and the Nerevarine cult. 33 As a gift, I gave Hassour Zainsubani a copy of "The Five Far Stars." He seemed surprised and pleased. He thanked me and offered in return to answer my questions about the Ashlanders and the Nerevarine cult. 34 Hassour Zainsubani said he would take my earnest thought and effort as a token in place of a gift. Because I behaved courteously, he is willing to help me, and tell me what wish to know about the Ashlanders and the Nerevarine cult. 35 Hassour Zainsubani says that he is too old now to travel, but that his son, Hannat Zainsubani, seeks out sources of fine ebony. The son has proposed to chart the rarely visited ancient underground complex at Mamaea, west of Red Mountain, and if I should meet him in my travels, Hassour Zainsubani asks me to tell his son that his father longs for news of his son-and-heir. 50 Finishes quest Hassour Zainsubani gave me some notes where he has written what he thinks I need to know about the Ashlanders and the Nerevarine cult. These notes will satisfy the Spymaster. But Hassour Zainsubani invited me to ask any questions I wish, and perhaps I can learn some other useful information from speaking with him. 1 Boderi Farano, the publican of the Ald Skar Inn, says that Hassour Zainsubani has many books in his room, and perhaps that would be a suitable gift.